The perfect snack while waiting for dinner, or to serve with a glass of Glögg, or to nibble on in front of the TV. Also a great hostess gift, if you'd like. And obviously very adaptable - use whatever nuts you want, and whatever spices as well. Just make sure to include some cinnamon and ginger for a holiday touch. Use about 750 ml in total - 3 cups. I used blanched almonds, cashews, hazelnuts and some pecans. 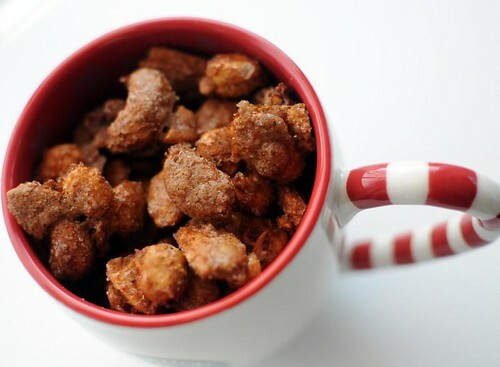 Start by placing all the nuts with the sugar and spices in a large bowl. Mix, using your hands. In a small bowl, whisk the egg white with the water until frothy. Add to the nuts, and again, mix well so that each nut is covered in egg white and spicy sugar. Spread on a lined baking sheet. Bake at 150°C for 30-35 minutes. Let cool before breaking apart. Keep in air-tight containers. I find spiced nuts absolutely addictive, so I would definitely get through this in no time at all! these look delicious..would be a great gift to give to friends as well!